How to use Mac TS Converter to convert TS to MP4, MOV on Mac? You need media player to play TS files on Mac OS X. iFunia Video Converter for Mac is a highly portable multimedia player for various audio and video formats (MPEG-1, MPEG-2, MPEG-4, DivX, mp3, ogg, ...) as well as DVDs, VCDs, and various streaming protocols. It can also be used as a server to stream in unicast or multicast in IPv4 or IPv6 on a high-bandwidth network. It supports Mac, linux, Windows. How to convert TS to MP4, AVI,MOV, etc. on Mac? You need iFunia Video Converter for Mac to convert TS to MP4, AVI, MOV, etc. on Mac. Then you can put them on iPod, iPhone, PSP, Xbox 360, iMove, other potable players. We recommend you iFunia Video Converter for Mac which can convert TS to MP4, Convert TS to MOV, Convert TS to AVI perfectly. This HD Video Converter also can extract audio from TS and convert to MP3, M4A, etc. Compared with other video converters, this TS Mac TS to MP4/MOV converter provides you with better output quality, more advanced functions and higher conversion speed. You can download free trial Version here. Then install and run this program. The trial version should be fully functional for what you want to do. Add the .TS files you want to convert to the program. Batch conversion is supported by this Mac TS video converter, so you can load several TS files at one time. Wanna edit your videos to make it more personalized? You may add a watermark in iFunia Video Converter for Mac. Just select the title you'd like to add watermark, then click the button edit button to launch video editing window. If you want to crop video or add some special effects, click the first tab. You're able to add a text watermark or an image watermark (you may call it logo) on the output video. Adjust the transparency to make the watermark look better. After you added TS files, you can select an output format for each video file. 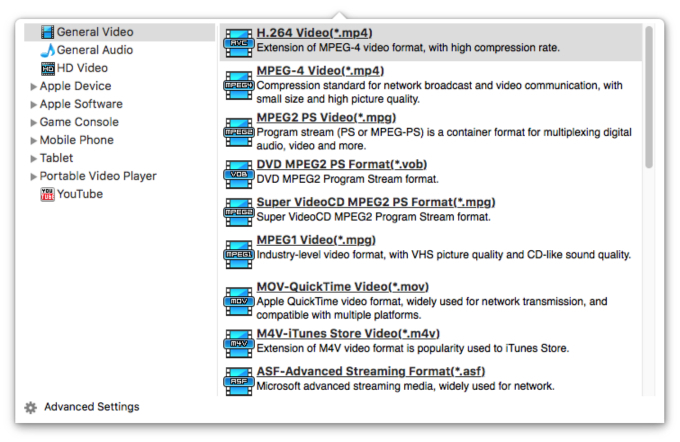 The TS Converter for Mac supports comprehensive video formats including AVI, MPEG, WMV, MP4, MOV, XviD, 3GP, FLV, etc. If you don't know what formats your device supports, you can just select the format according to the device name. For exapmle, you can select 'MOV-QuickTime(*.mov)' when you want to convert TS to QuickTime on Mac. The default setting works well. Of course, if you don't want to use the default video and audio encoding settings, just click the setting button to customize these settings.